The illustrated Jaeger LeCoultre caliber 889/2 uses a switching rocker to accomplish bi-directional winding. This is an efficient, simple and elegant engineering solution. Power is transferred from the central rotor (5) to the first transfer wheel (1). Wheels (2) and (3) are mounted on a “switch plate” that swings back and forth and brings either (2) or (3) into connection with transfer wheel (4). 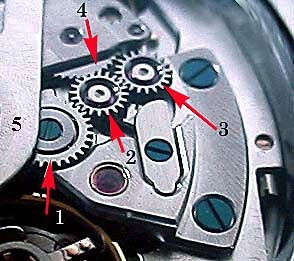 In clockwise rotation of the central rotor, power is transferred from (5) to (1) to (2) to (4) and then on to the mainspring. In counterclockwise rotation of the central rotor, power is transferred from (5) to (1) to (2) to (3) to (4) and then on to the mainspring. So, the addition or removal of wheel (3) from the gear train allows wheel (4) to always rotate counterclockwise regardless of the direction of the central rotor. The direction of rotation of wheel (1) determines which way the rocker will switch.